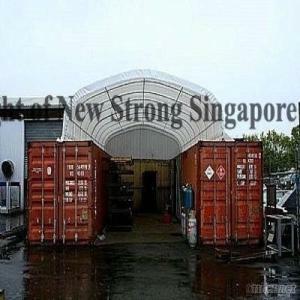 Our container shelter series are very popular in many countries, especially in European countries, Australia and New Zealand. They are easy installed onto containers or buildings which can create very big room for customers under very low cost. And they have strong frame to stand wind. All container shelters could be an option of adding end panel as per customers' requests. Frame: High quality powder coated steel single tube structure. Cover: 300 gsm PE(polythene) or 610 gsm PVC fabric, high standard UV treated for long durability, fire retardant and 100% waterproof. Service Equipments, Cargo & Storage Equipments, Cargo & Storage Equipments/n.e.s.